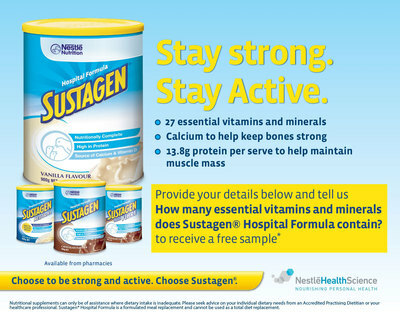 Nestle Sustagen is a health drink with 27 essential vitamins and minerals and 13.8g of protein which aids in muscle mass.They are currently giving away free samples when you answer a simple question here and enter your details. This offer has a limit to 3000 respondents so be quick to grab your offer.Also there is a limit to one sample per individual with a valid email address. Nestle Sustagen comes in many flavours and caters to kids, diabetics and anyone who needs a boost of vitamins and minerals. kids,diabetics, seniors or all people who live on earth..